Rosemary is a well-known herb that grows incredibly well here in the desert land of Tempe. You can see it bordering buildings on the ASU campus or in residential gardens. Tug gently on a branch when you walk by, and you’ll be left with an authentic aromatherapy dose on your fingers. It is a symbol for remembrance and was used in funerals; it is also a symbol for friendship and has been used for centuries in wedding ceremonies. The spiky herb can be quite helpful around the house with uses ranging from a spice for cooking, essential oils, a memory enhancer, perfume, tea, or in the medicine cabinet for skin care. The green sprigs are also quite useful in meat preservation by wrapping the pieces tightly before storage. Rosemary is in the mint family and similarly aids in digestion and calming the digestive system or simply ridding a headache. Externally, if made into an oil, it can aid as a muscle relaxant, treating sciatica, pulled, or strained/overworked muscles. Interestingly, it naturally contains its own essential oils such as borneol, camphor cinelole, linalol, and verbenol. At Southwest Institute of Natural Aesthetics, we try to spotlight our natural friends who support our skin in a healthy, positive way and rosemary is no exception! Aesthetically speaking, it is considered to be a natural skin rejuvenator and toner. 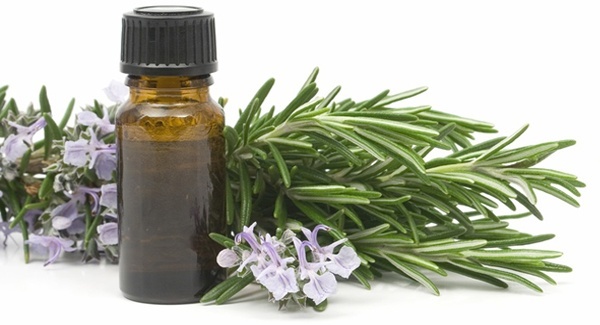 You may be familiar with Queen of Hungary Water, a popular beauty tonic: its main ingredient is rosemary. Our friendly herb helps strengthen the capillaries and improve circulation for a natural, healthy glow. Additionally, its anti-inflammatory properties will fight against early day puffiness after sleeping, although be mindful of application in the eye area. In Arizona, we pay special attention to skin preservation due to our intense exposure to the sun and rosemary is an excellent combatant of sun damage, sun spots, and free radical damage. The rich nutrient content of iron, calcium, vitamins E/A/C, natural fatty acids, antioxidants, and phytonutrients is another reason many skin and hair products use rosemary in their products. Hylunia, a highly regarded company who produces some of SWINA’s aesthetics-grade skin products, also supports these findings and adds that it is an excellent ingredient for anti-aging creams, toning, and for binding loose or sagging skin. An astringent contracts the skin tissue, resulting in a tighter complexion; rosemary oil, when applied to a cotton ball, can be used on the face after washing and before applying a moisturizer. It is also wise to treat acne or pimples with products containing rosemary because of its anti-inflammatory and anti-septic properties. Is there anything this plant can’t do? Remember (need some rosemary? ), we’re lucky that rosemary grows well in hot, dry climates. To utilize this plant in your own yard, plant one in your garden and take a look at the following ideas. Finely grind oats and dried rosemary with mortar and pestle, food processor (on pulse), or a handcrank grater (usually for cheese). Topically apply over face; wait 15 minutes and rinse. Only make as much as you think you will use because it will spoil. The dry mixture can be stored in a mason jar for next time! Bring 3 quarts to a boil and remove. Add the dried rosemary to the pot of steaming water. Wait 5 minutes. 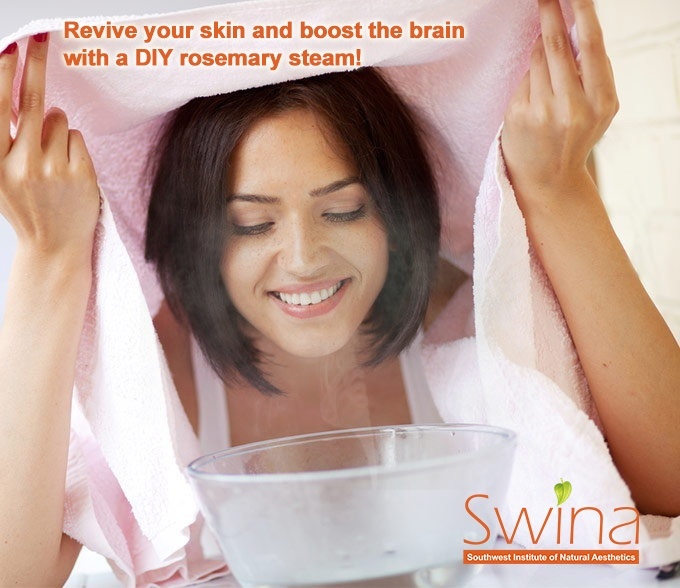 Place your face about a foot above the pot and drape a towel over your head so that the face can absorb the steam. Every minute or so, stand up straight to take some fresh air. Repeat the process for 5 to 10 minutes. To finish, cleanse the face with a mild cleaner and rinse with water. Using a small bowl, pour 2 tsp of coconut oil and 2 tsp of castor oil and heat for 1-2 minutes on a low flame. Add 4-5 drops rosemary essential oil and stir. Massage into scalp after it has cooled. Mix with almond oil with lavender and clary sage and smooth down length of hair. Comb/brush through to disburse evenly. Repeat every 2 days if desired. Rosemary is simply a power-herb for all sort of remedies and treatments. It is also an excellent antibacterial and anti-fungal and can be mixed with a myriad of other essential oils. Through the next few months SWINA’s site will be posting more incredible uses for other herbs and essential oils. If you haven’t yet, plant some herbs in your yard and reap the rewards for offering your love and care! Learn more about skin rejuvenation services offered by SWINA. We also invite you to learn about natural aesthetics educational programs offered by the Southwest Institute of Natural Aesthetics.